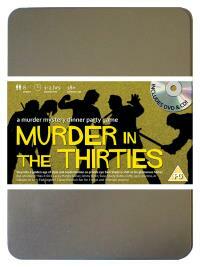 You've been invited to play the role of AL DABONE in Murder in the Thirties. Who shot Sam Shady? Rooseville, 1931. Sam Shady, private eye to the stars, is celebrating his birthday in style. He’s invited all his current clients, as well as his closest rival, to dinner at his classy house. As his guests are getting to know each other before the first course arrives, Sam steps outside for a quiet smoke and shortly afterwards, he is found lying dead in the middle of his lawn. Find out who made Sam’s birthday go with a bang! Pet shop owner (his bark is worse than his bite!) Costume : You firmly believe clothes make the man, so you’re only ever seen wearing a stylish double-breasted suit cut from fine Italian cloth, matched with Italian leather shoes. An expensive silk tie is your only concession to colour. You are the owner of a successful chain of pet shops called “Give DaDog DaBone” and a prominent businessman with contacts in every field. You recently met Sam Shady through a client of his and the two of you formed a working relationship, helping each other out where possible. You have been married to Mandy Seever for the last three years.